Since there is absolutely no movement in Nifty since the India-Pakistan tensions I am sure all directional traders by now must have lost much more than they made when they bought calls and puts on that day. This is the life of directional traders. They seldom make money but do not let their ego die and still are willing to lose money trading the direction. Whereas the non-directional traders rarely lose money and even if they do, if the trades are properly hedged the losses gets limited which does not affect their pockets. They are happy and move on. If you are my paid subscriber of my course please note that India VIX has again fallen today. If you entered the trade Strategy 1 last month it should be in profit now. If the profit what we need is met please close the trade and take money off the table. Do not forget to thank the directional traders. It is strange that people still ask me questions on where and how to find direction so that they can make a lot of money trading the stock markets. 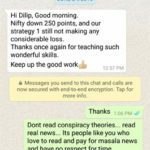 Today morning itself at 9 am I got a call asking how to predict direction of Nifty from Nifty Option-Chain? Option Chain is nothing but quoting of options prices through a list of all of the options for a given security like Nifty, Bank Nifty, or any other Stock. An option chain is simply a listing of all the put and call option strike prices along with their premiums for a given maturity period. Now tell me after seeing all this can anyone tell where is Nifty Direction heading? No you cannot. That’s the reason please do not run after direction – it will change the direction of your life from positive to negative. Whatever you have made in life will be lost running after direction of the markets. 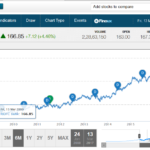 I agree that if you can really get the direction right 80% of the times you can double your money in 6 months or less and make a lot of money trading Nifty or stocks. But both are a huge myth – finding the direction of a stock or Nifty in the short term and making a lot of money trading stock markets in the short term. Let me also give you another example why finding the direction of Nifty with 80% success rate is nearly impossible. Can tell me in which direction your life will go tomorrow? But you will have to tell me with a guarantee. For example will you get a promotion tomorrow or will you fall sick or not or will you meet with an accident or not or will you reach your office on time or not? Can you answer me all of the above questions with guarantee? I am sure your answer is no. When you cannot predict direction of you own life within a few hours from now (on which you have full control) – how can you predict where Nifty will be tomorrow (on which you have no control) with a guarantee? No you cannot. If you were right it was fluke. If wrong it was reality that most of the times you cannot predict movement of a stock in a very short period. That is the reason I keep a reality check on my subscribers from time to time so that they avoid losing money. What do I get by writing these things in return? Nothing. But I will write the fact whether you enroll for my course or not. I could have easily written do my course and make money fast and I would have get a lot of clients in a month. But sorry I cannot lie and take your money I am not like others and never will be. If you believe what I am telling is correct only then do my course. It is a slow and steady process of making money without any tensions or hassles of keep looking at Nifty. And yes with time do compound your money. So that after a few years you have enough not to worry any more about money. Thanks and I wish the same to you. As you said in your mail you get nothing by writing all these awakening thoughts about money, stocks and life, but the ultimate success and riches by sharing with what you are bestowed by God. Finally as a novice, I want to know whether I can earn 20k per month with 1 lakh capital after learning your course or not. Please let me know. If it embarrasses you leave it. No not a single person on this Earth has made consistent returns like 20% a month in Stock Markets. I think 3% is more than enough a month. This is what you will make. If 20% a month was possible no one do MBA, Engineering or take up a job. Hope you understand and please do not pay to anyone who says yes you can make – they will take your money away. If you dig deep in to the option chain, you will see that the market generally reverses direction at the strike price of max open interest. For eg, its good to buy when price is nearing the max puts( provided puts at that strike are continuously increasing with price is near) and its good to short when price is nearing max calls( provided calls at that strike are continuously increasing when price is near). If the price is about to break out from the max open interest strike, the numbers of puts( for a break down) and the calls( for break out) will generally decrease. You can back test this for yourself, in the recent months and see the option chain predicted precisely. IMP NOTE: Please take this as educational purpose only as it is just a comment. Please do your own research before doing what Michael is saying. I will do research on this and write a post some day. But what he says is if true then why most technical analyst fail? They should be doing the above and make a lot of money. So on the face of it I do not agree until research confirms this. So it means what ever resistance support market make in option is fake . If correct they think they are genius — if wrong they blame luck – else they should be correct all the time. Great one, keep going. Thanks a lot for sharing. I am new in option trading. Started journey will Dilip paid course. I made money in last two months. Return slightly more than 3 percent. I have became now more adventurous. Did huge number of trading in future and options. For me I will increase volume and relax more. Welcome Arindam. Glad you are making money.